6 Week Online Course - Enrollments Close 5pm Friday, 7th September. 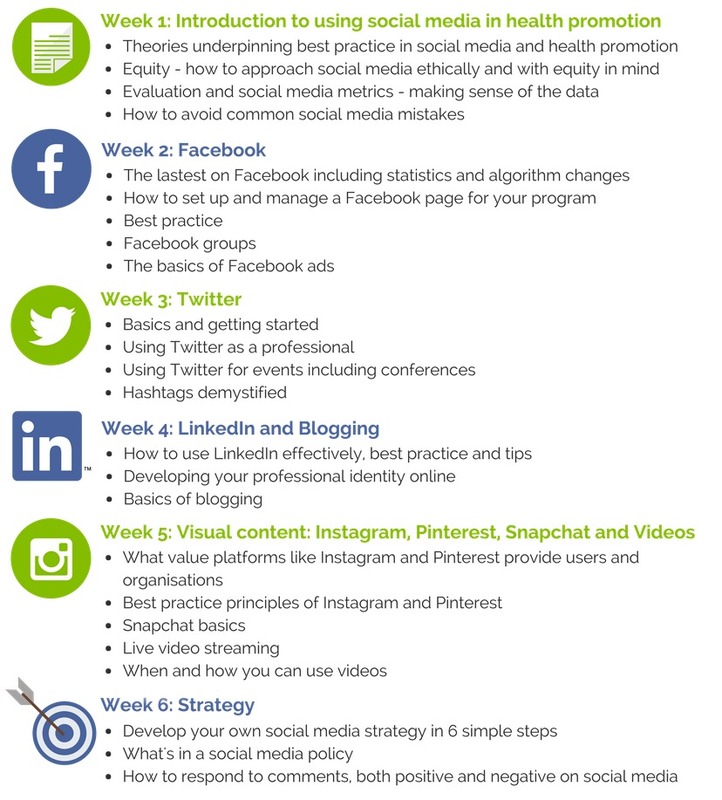 Are you thinking about how you can use social media effectively in your health promotion program? Are you confused by the different social media platforms and options? Do you want to upskill and build your competencies for a career in the digital age? Do you want to learn from someone who understands health promotion and all its challenges? The Health Promotion Social Media School is a 6-week online course designed for health promotion, public health and community development practitioners. This course has been especially developed for practitioners and organisations with a health promotion or community development focus to understand how social media can be used as a tool and a strategy. Social media is not new, it's just a new way of doing old things. This course will help you to see how your existing skills and knowledge can be applied to each of the major social media platforms. Venturing into social media can seem intimidating for practitioners who have not had specialised training and don’t see themselves as “marketers” or tech savvy. With this course you are given information, tools and support to apply best practice social media to best practice health promotion. The course covers everything you need to go from social media zero to hero. The course also incorporates a closed Facebook discussion group with all participants where you can network with like-minded professionals, discuss ideas and ask questions. The course is delivered weekly on a password protected membership site. On the site you can watch the presentation videos, download the workbook and then head to the closed Facebook group forum where you can ask questions and network with other participants. The Facebook group is your chance to have a social media consultant on hand to provide advice, information and support during the course, as well as a supportive network of course alumni. The course content takes approximately 2 hours per module, which includes watching videos, workbook activities and interacting with other participants. The content can be undertaken at a convenient time to fit into your work schedule. The beauty of an e-course is it removes the cost and time of travel to attend live workshops or seminars. Part-time staff can participate in training without worrying about swapping work days or losing too much time in travel. The course content remains available to you even after the 6 weeks. Even if you are away or fall behind, you still have access to all course materials, including any updates in the future. The course will commence from Monday, 10th September (week 1) until Friday 26th September (week 6). There will be a 1-week content break after week 3 to give you time to catch up on any missed materials. The course content for each week becomes available on the Monday of that week. Monday 1st October: Mid-course content break and catch up! For the first time this round there will be webinars held live as part of the course each week. If you can't make it, the webinars will be recorded and made available to you. It's another value-add for participants and a way to ask have your questions answered. The webinars will be informal and include a summary of the week's content and a chance for Q and A. Dates and times will be advised after enrollment. Please don't be concerned if you are unable to attend these as they are going to be recorded, and attendance is a bonus not a core part of the course curriculum. Our philosophy is that professional development should be accessible, practical and fun! Kristy has 15+ years experience working in health promotion and public health in South Australia and London. She has worked across a range of settings and topic areas including blood-borne viruses, obesity, youth health, mental health, tobacco & breast cancer. In 2013 Kristy founded Zockmelon, a consultancy which aims to help public health organisations effectively use social media and other technologies in their programs. Kristy currently runs online and face-to-face training on using social media in health promotion. Kristy was awarded the Public Health Association of Australia and Australian Health Promotion Association (SA Branches) South Australian Primary Health Care Practitioner in 2014, and was recognised as one of South Australia's top 40 under 40 business leaders in 2018. The course is designed with health promotion, public health, community development practitioners or managers in mind. It's really for anyone who is working in a project or program who wants to understand fundamental principles of social media and the key aspects of each platform. It's ideal for people who have perhaps just started tweeting or using Facebook for work and want to know a little bit more. The course is not designed for experienced social media managers as it is pitched towards a beginner-intermediate level. I am unable to pay by credit card or PayPal, can I have an invoice issued and use direct deposit? Yes, we can issue an invoice for payment using direct deposit to be paid prior to the course commencing. Please email Kristy@zockmelon.com.au including the name and email address of the participant. The course is delivered weekly on a password protected membership site. Each week course participants will have access to a new module including presentation videos and a workbook. It is recommended that participants set aside approximately 2 hours each week to watch the course videos, read the workbooks, check out some of the additional links and resources and discuss your ideas or comments in a closed Facebook group. For the first time in the September round, there are bonus Live webinars each week which will be approximately an hour. This is in addition to the pre-recorded content. Webinars will be recorded and made available. You will be able to download and save the workbooks for future reference. Whilst the content is disseminated weekly so you don't experience overwhelm, participants have ongoing access to revisit and review all content (there is no expiry date for as long as the course is being run by Zockmelon). Participants will be able to have ongoing access to the content so when the course is run in the future, you will also be able to access any new and improved content at no additional cost. This essentially gives you access to ongoing social media professional development, in addition to being able to ask questions in the Facebook group. What if I fall behind in the content or have annual/sick leave? That's the beauty of an online course. You will always have access to the content and can work through the modules at your own pace. What if I don't have Facebook, how can I access the discussion forum? If you don't have Facebook, we strongly urge you to set up an account for the purposes of this course as you cannot access the discussion group without an account of your own. The Facebook group is closed strictly to course participants and is not open to the public. You are not required to 'friend' anyone and you are able to leave the group at any time. Previous experience with e-courses has shown that online groups add an important element of interaction and participation in lieu of the 'live' experience of workshops. Do I require any special software for the course? No. The course will be hosted on a secure membership platform so you just need to set up a registration and password for the site and you can watch the videos and download workbooks from there. The webinars will be hosted on Zoom which is free for you to use but you may wish to download the softward in advance. I am a researcher or doing a PhD/Masters/Honours, is this course suitable for me? You will definitely gain a lot of benefit from the course, in particular sections on using Twitter, LinkedIn and blogging. This course will help you to think about your professional identity online and use social media to build your professional and academic reputation. Our organisation does not generally work at a community level but with other organisations and professional groups, is this course suitable for us? Yes. You will find this course relevant to you as the principles and best practice aspects are able to apply to a variety of organisational contexts. Examples and case studies within the course also cover organisations who do not necessarily communicate directly with the general public. I run a health-based business. Is this course right for me? Please be aware this course is designed for health promotion, public health and community-based organisations, rather than for a 'for profit' focus. 1:1 social media coaching and strategy can be provided for businesses on request (email Kristy@zockmelon.com.au). There have been participants prior undertaking this kind of work who have benefited from the course, but you should be aware that this is not the focus of this e-course. Is my course registration transferrable? Yes, you can transfer your course registration to any other member of staff from your organisation. Please ensure that your transfer is provided in writing (email Kristy@zockmelon.com.au) with the old and new registration details including the alternative name and email addresses strictly by Thursday 6th September 2018. Once the course has commenced transfer of registration is not available. Changes of mind refunds will not be given once the course has commenced. If you are dissatisfied with the course please email Kristy@zockmelon.com.au to discuss further, however, we are confident that you will feel there is excellent content and value for money in the course materials. Yes, if you require a receipt for tax purpose or for reimbursement please email Kristy@zockmelon.com.au. Please note receipts will be automatically generated when ordering online. The course is not accredited. When you complete the modules, participants receive a certificate of completion that can be downloaded and printed. The course is evaluated using an anonymous participant survey. The survey provides information on how the course structure can be improved and how participants implement the skills and knowledge gained in the course. Course evaluation is taken seriously in the interests of ongoing improvement and we encourage all participants to complete the survey. Please email Kristy@zockmelon.com.au with any questions you are not able to find answered on this page. Enrollments Close 5pm Friday, 7th Spetember.